Database files are important for all users and store lots of important information. Learn about manual and professional solutions to repair corrupt SQL database files. Today's MS SQL Server is one of the most popularly used relational databases. It has advanced internal structure and offers great reliability. That is why most organizations use the SQL Server database to save all crucial business data. But there are some situations, like virus infection, operating system failure, corrupt file system, etc., due to which SQL database becomes corrupt and all data stored in it is inaccessible. Repairing .mdf files from the corrupted state in SQL Server is not an easy task. A user can use the manual technique to repair corrupted MDF file in SQL database but this is not a reliable approach because there is no guarantee of data recovery using manual approach. However, there are also third-party tools like SysTools SQL Recovery that claim to repair .mdf file in a perfect way. Therefore, in this post, we are going to discuss best possible solutions to repair a corrupt SQL database. But before that, it is important to understand the reasons behind corruption in SQL databases. Corruption in storage media where all MDF files are stored. If a user has stored the SQL database in a compressed folder, then there is a chance that the MDF file will become corrupted. Any modification or changes are done in a SQL Server account. A user may have deleted some data accidentally. If the file header is corrupted, then it results in corruption in MDF file. If SQL database is in use and in between there is a network failure, it leads to corruption in MDF file. Other possible reasons that cause MDF file corruption are virus attacks, hard disk failure, abnormal system shutdown, and abrupt power failure. Msg 823 error in SQL Server/Msg 824 in SQL Server/Msg 825 (read retry) in SQL Server. Apart from all this, there are some other error messages that a user may encounter while accessing a corrupt SQL database. Therefore, it is the responsibility of the database administrator to do something immediately and prevent any type of data loss. 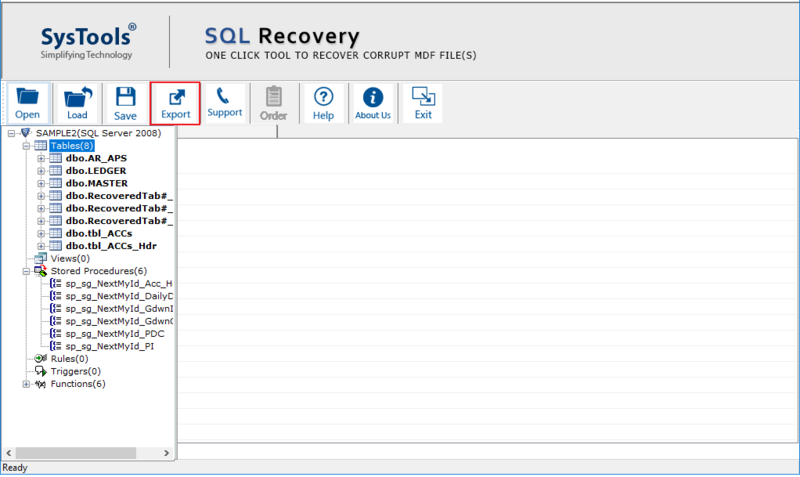 There are several manual methods available to repair a corrupt SQL database but manual solutions do not guarantee database recovery. 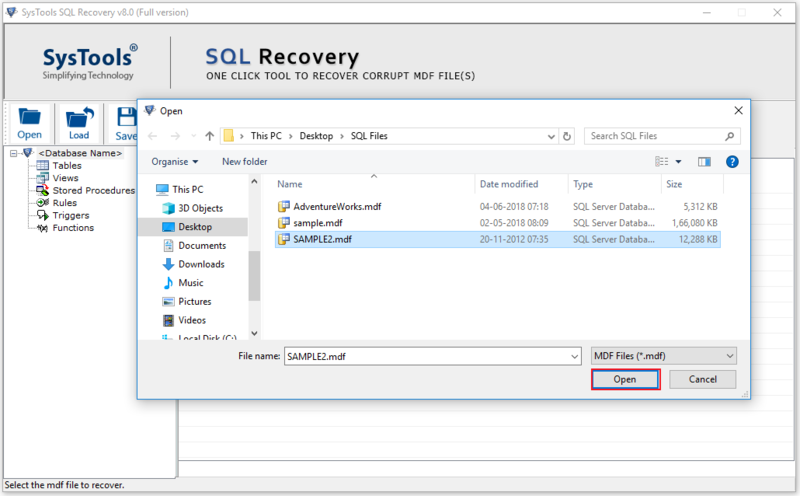 In order to restore the corrupt database, a user can use NDF files (log files) of SQL Server. But only log files are not sufficient to restore the database in most corruption cases because sometimes, with major corruption, backup files also become corrupted. Another possible way to repair and restore the corrupt SQL database is with the help of database console command i.e. DBCC CHECKDB. It is really helpful in fixing minor corruption issues in a SQL Server database. Note: You can also define some options like no_infomsgs and infomsgs with DBCC CHECKDB. After that, you need to check the index ID. Case 2: If index ID is either 0 or 1, then run DBCC CHECKDB again with the appropriate repair options like repair_rebuild, repair_fast, or repair_allow_data_loss. Now, to ensure zero corruption, execute DBCC CHECKDB and a message is displayed i.e. DBCC CHECKDB displays 0 allocation errors and 0 consistency errors in name_of_your_corrupt_database. What If the Manual Method Fails? Manual solutions are not always a foolproof solution. They may have some limitations. For example, in the case of severely corrupted MDF file, manual fails very easily. Moreover, a manual solution requires a user to be technically strong. Therefore, it is advised to use some authentic third-party software to repair corrupt SQL database. 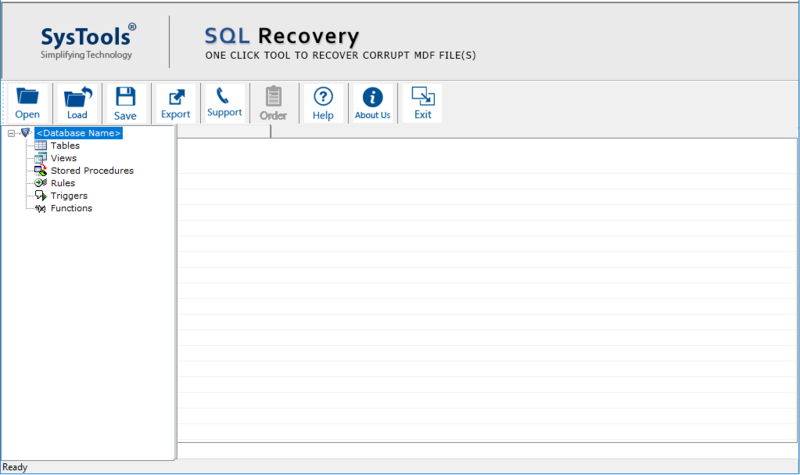 SQL Database Recovery Program is one of the best utilities to fix any type of corruption issues in MDF files. 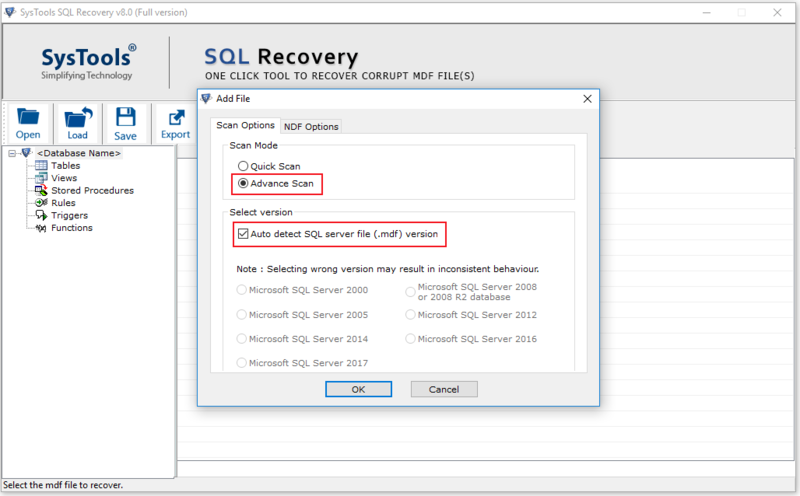 SQL Recovery Tool is capable to repair corrupt SQL database files — both MDF and NDF. It is a risk-free software and recovers all data items stored in it like tables, rules, triggers, functions, etc. Apart from all this, the software will repair the database in just a few clicks without wasting any time. 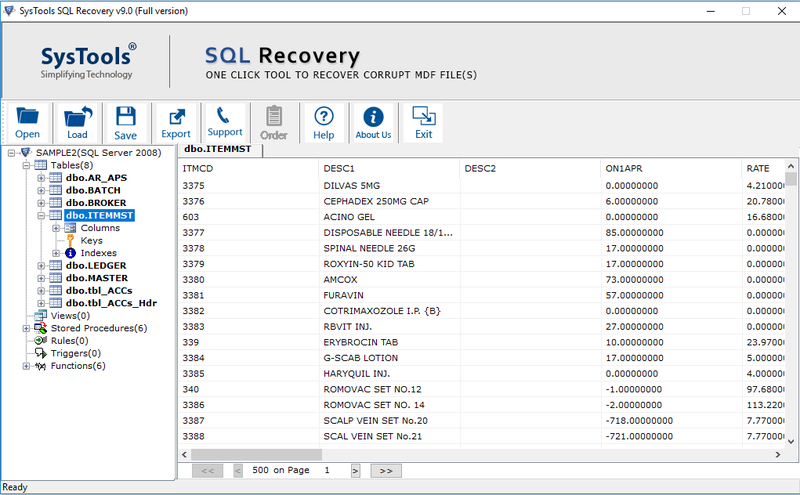 Download and run SQL Recovery Program on your local machine. After that, open the corrupt SQL database file (.mdf file) of your choice. Choose the Scan Mode and click OK. The tool will provide a preview of data items stored in corrupt the MDF file. Click on Export to save the recovered database. Database files are really important for any users, as they store lots of important information. Any type of corruption issue in SQL database can create trouble for users. Therefore, to overcome all these issues, we have discussed both manual and professional solutions to repair corrupt SQL database files.